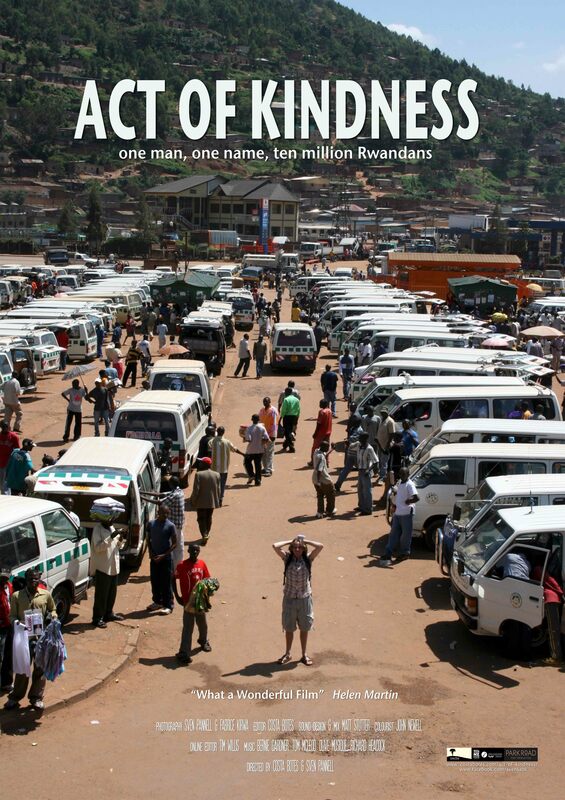 Act of Kindness is a true story about a young New Zealander’s search amongst the streets and shanties of Rwanda for a homeless, crippled beggar who years earlier had helped him out of a dangerous predicament. Hopeful of repaying his debt of gratitude to this unlikely samaritan, he pursued a seemingly hopeless task, tracking one man amongst ten million – a man he only knew by a single name … ‘Johnson’. The film offers an inspirational example of empathy and a rare positive perspective on a place mired in tragedy. Rwanda may be forever haunted, but life goes on, and its people deserve to be seen as more than just victims and executioners. Melbourne Documentary Film Festival Sunday 16 July, 6.30pm, Longplay, Fitzroy NB: this is not yet locked in, please consult Melbourne DFF programme closer to the time, or check back here. I will be attending to do a Q&A. Act of Kindness was some years in the making. In 2007 Sven Pannell went back to Rwanda to try and find and reconnect with ‘Johnson’, the homeless man who had assisted him almost a decade earlier. He was moved by an inner sense of obligation that had grown steadily over the years. Pannell had nothing to go on except one name, and his memories of what the man had told him. He was a homeless beggar, a survivor of the genocide who had lost his wife and eight children during the killing. He was, perhaps, the last person one might have expected to help a stranger in trouble. Though Sven escaped his predicament, he left Rwanda in circumstances that made it impossible for him to thank his benefactor. Over the years he increasingly felt a debt of gratitude that needed to be acknowledged and repaid. He was ultimately tipped into action by the idea that his search might be an interesting topic for a documentary. 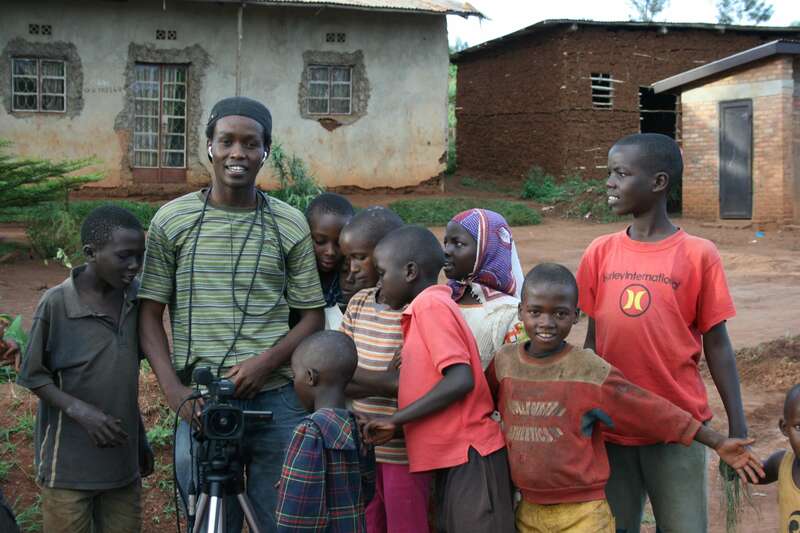 And so, with a camera in hand, he returned to Rwanda. In the spirit of a true optimist, he thoroughly underestimated the difficulty of both his quest, and the attendant problems of making a film about it. If the link isn’t working, please cut and paste the url into your browser. And here is an interview with Sven Pannell, recorded on NZ National Radio, Nine to Noon with Kathryn Ryan. Yes. DVDs can be supplied on request to NZ and international customers. Please contact me via: lonepinefilms@gmail.com for details. I’d like to know when your movie will screen in Palmerston North. What would be the best way to make sure I don’t miss your movie when it does come? Act of Kindness was not selected as part of Palmerston North’s NZIFF programme. I suggest you take this up with them. The film does not have a NZ distributor. A not untypical situation for small independent films. As a very small production company, I don’t have much time and no budget to take on the task of national distribution. My intention was to get the movie out via NZIFF, and then through as many independent theatres as are willing to show it. I suggest you lobby your local theatre. PN does, I believe, have some screens that show Arthouse or Indy type films. I can arrange to provide suitable screening copies, and artwork for ads or printed material. Depending on how we go with theatrical opportunities after NZIFF, I will make a decision on when and how to make the film available via DVD and video on demand online. I think it is a huge shame that a local NZ film that would struggle for distribution isn’t given a wider release via NZIFF. I will make some enquiries with local venues. Well, the reverse might be true. Without NZIFF’s commitment to screen it early on (based on a frankly lacking ‘work in progress’), there would be no film. I’m just glad the movie turned a creative corner and has found some reward amongst enthusiastic and packed houses wherever it has screened during NZIFF. The reality is there are a LOT of movies out there and cinemas can’t show ten percent of them. I will do what I can to get AOK out into regional theatres, but it’s pretty tough with usually scant return for the time and effort required. Most likely, unless people mobilise via social media to organise and lobby for opportunities, the opportunity to see it will have to be via DVD and online VOD. Re the latter, I have been using Vimeo for other titles, and this works well, and is an economical way to see movies. If you have a hookup like Apple TV, or equivalent, then you can watch streaming movies on your TV, which is a nice way to see stuff. I’d love to watch this film. Loved the trailer. Will it be screening again soon in Auckland? Never say never, but attempts so far to enlist theatres prepared to give us a chance haven’t been very encouraging. My focus now is on trying to get AOK into international festivals. I’d love to see it, online via Vimeo or some other equivalent. Keen to support this film and others like it. Is this likely any time soon? thanks for the feedback. Vimeo or any other form of online VOD is at least 6 months away. Ditto DVDs. Our focus right now is to try and get the film into some international festivals. It’s very, very hard. Unfortunately, having the film available in any online form makes it instantly ineligible for festivals. Why are they important? Because there’s virtually no other route that counts for small indy films. Online is a wild west where orphan films languish in obscurity. FYI … if you are in NZ, Rialto (Sky) TV have purchased rights, so I guess they’ll be screening it some time in the near future. Also, we are in the process of selling rights to Air NZ InFlight, so you might be able to catch on an airplane after April. If this movie doesn’t doesn’t go global as an inspiration to the world I will be most surprised. Johnson and Sven are the heroes here. Thanks for reaching out with this great feedback. Much appreciated. I ‘shared’ Seven Sharp’s interview with Sven Pannell on my FB page to track down this movie when I returned from Europe late 2015. It has come up as a ‘memory’ and I would really like to know how I can obtain a copy. Very interested to hear that Air NZ have screened it on their flights and how much it was enjoyed by the comments on this page. Is this movie available on DVD for purchase. If so can you advise where? I would very much like to see it. Act of Kindness gets its first TV screening in NZ via Rialto TV this Wednesday, 20th July. I planned to make DVDs available from my web store (www.costabotes.co.nz) by this week. I’m slightly behind schedule due to pressure of other work, but I hope I can get this up in the next couple of days. However, I can supply DVDs on request if you email me to arrange it. The cost for personal (home) use is 35.00 plus 6.00 postage. I’m sorry if that seems a bit high, but I have no economies of scale to bring the cost down. This title won’t be generally available in stores or DVD rental outlets. Unfortunately, there aren’t any distributors left in business who will take on small Indy titles like this.